New Orleans Good news in a bleak horizon: the National Mediation Board approved a rule change allowing the majority who cast their vote for a union covered under the Railway Act to determine representation, rather than a majority of those eligible to vote. This should mean a significant increase in unionization within the airline industry, which is already one of the few remaining industries with excellent union density, as well as being a boost on the ground for some of the land based workforce at airports but covered under the Railway Act, like ramp workers and, importantly, some of the security workers assisting the TSTA workers. This won’t be a slam dunk regardless of what some of the “union free” right-to-work folks will say, because for years companies opposing unionization in the industry have convinced people that a NOT VOTING was the same as a NO vote, which was true under the old rules, but there have also been many union representation elections where unions have been decisive winners by huge margins among those actually marking the YES box, but still failed to win certification because the winning tally did not exceed the 50% plus one needed to represent a majority of all eligibles. Big unions that stand to gain because of this rule change should be the Teamsters and the Communications Workers and maybe even the Transport Workers, all of which have a significant presence in the industry. 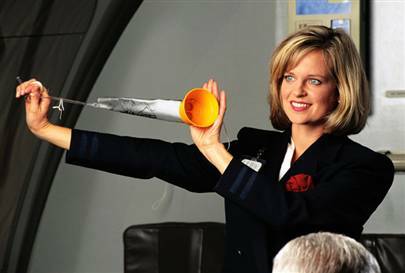 The flight attendants and the pilots will also do well. The Railway Act covers all interstate transportation workers and is administered by the National Mediation Board, which is why airline workers come under its jurisdiction. This has been a weird and unfair exception to commonsense for decades existing only to thwart unionization, so it’s good that the Obama appointees did the right thing. If not for the hyper conservative and risk adverse politics of Secretary Napolitano and her Homeland Security outfit, the next big unit that should be rationalized under the Obama administration in this same space would be the TSTA agents handling the screening at the nation’s airports. George W. Bush in a fit of pique and animus declared these folks ineligible for unionization in the build up in the wake of 9/11, but there’s no rational excuse why they should be denied the same kind of representation that other federal employees receive. They don’t wear guns, so it is ludicrous to declare that union representation would be un-American and expose citizens to security risks because they had contract protection. Part of the job is done and more waits to be set right, but the airports are destined to wear a union bug, and that’s the way it should be! This entry was posted in Labor Organizing and tagged CWA, Teamsters, Transport Workers by wade. Bookmark the permalink.